Measure Yourself Concerns and Wellbeing (MYCaW) is a validated person-centred measure of the concerns and wellbeing of people affected by cancer. Research suggests that the concerns of informal caregivers (ICs) are as complex and severely rated as people with cancer, yet MYCaW has only been used to represent cancer patients’ concerns and wellbeing. This paper reports on the development of a new qualitative coding framework for MYCaW to capture the concerns of ICs, to better understand the needs of this group. This multicentred study involved collection of data from ICs receiving support from two UK cancer support charities (Penny Brohn UK and Cavendish Cancer Care). Qualitative codes were developed through a detailed thematic analysis of ICs’ stated concerns. Thematic analysis of IC questionnaire data identified key themes which were translated into a coding framework with two overarching sections; (1) ‘informal caregiver concerns for self’ and (2) ‘informal caregiver concerns for the person with cancer’. Supercategories with specific accompanying codes were developed for each section. Two further rounds of framework testing across different cohorts allowed for iterative development and refinement of the framework content. This is the first person-centred tool specifically designed for capturing IC’s concerns through their own words. This coding framework will allow for IC data to be analysed using a rigorous and reproducible method, and therefore reported in a standardised way. This may also be of interest to those exploring the needs of ICs of people in other situations. The term ‘informal caregiver’ (IC) refers to a spouse, family member or friend, who may provide care to an individual who has acute or chronic needs . They may be involved in the management of medical tasks, financial and emotional support and co-ordination of care, amongst many others , thus play a pivotal role in how well patients manage their illness [3, 4, 5]. The prevalence of cancer survivorship is rising globally. In the UK, there is a 3.2% annual increase in cancer survivorship as the development in medical treatment for people with cancer advances . Increasing alongside the rising number of people with cancer is the number of people who are ICs. It is estimated that 1.1 million people are now acting as ICs to someone with cancer in the UK  and that 7% of carers in the USA are caring for a person with cancer, which is estimated to be 2.8 million people . There is a paucity of data on prevalence of ICs globally despite the many research studies conducted around the world that reveal the similarity in unmet needs of informal caregivers of people with cancer [e.g. 9, 10, 11, 12]. The emotional, social and financial stress cancer places on a caregiver is known as caregiver burden. 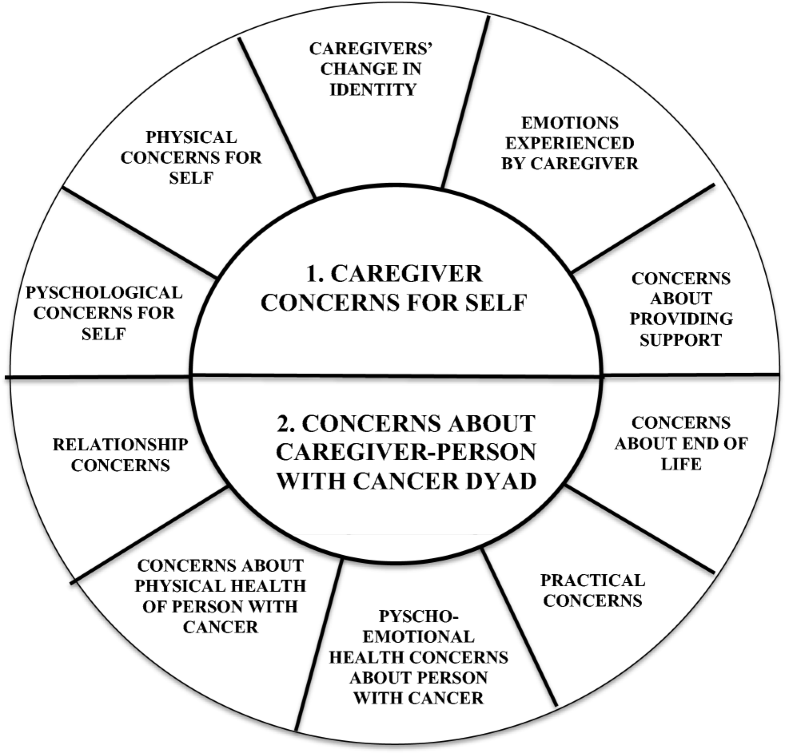 Caregiver burden is multifaceted, for example, Stenberg (2010)  identified that caregiver burden was significantly associated with direct and indirect care duties for the cancer patient, whilst Tan et al. demonstrated a significant relationship between emotional distress, quality of life of the caregiver and caregiver burden. The level of burden is known to persist over time after diagnosis , and increasing levels of caregiver burden is the cause of distress and illness for many ICs [13, 15, 16, 17]. A significant body of evidence suggests that there is a symbiotic relationship between the levels of stress experienced by people with cancer and their ICs [13, 18, 19, 20, 21]. Factors which may account for the distress posed include negotiating roles from partner to carer in relationships, reprioritisation of lifestyle and responsibilities related to employment and childcare. Psychological difficulties may become prolonged because of the IC’s sole focus on the cancer patient’s needs and therefore disregard of themselves [22, 23]. The role of the IC can fluctuate in correlation with the different stages of the person with cancer illness and their needs [24, 25, 26]. Cameron (2002) , for example, reports that during the patient’s early stage of treatment, the caregiver’s psychological state of mind is greatly affected but psychosocial and physical concerns may predominate in later stages of cancer progression, e.g. factors such as social support, employment and the role of supporting and providing quality of care for the cancer patient. ‘Early and adequate support’ for ICs can improve their own health and wellbeing outcomes and those of the person they are supporting . Despite the excellent biomedical treatment for people with cancer, inadequate provision for the needs of ICs in the UK means that cancer charities are currently the main providers of informal support and information for this population. Approximately half of ICs receive no support at all . A further report from the Macmillan Cancer Support revealed four in five ICs (n = 386) felt that their caring role affected them, most commonly their emotional wellbeing, social life and relationships . More recent strategic developments in the UK have prioritised the need to work in collaboration with voluntary organisations and general practice to identify innovative ways to support carers generally . In order to deliver new ways of supporting ICs, the needs and concerns of this group must be fully understood. Several patients reported outcome measures developed can measure caregiver burden and levels of quality of life and wellbeing in cancer caregivers. 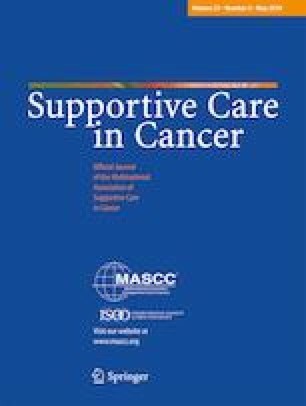 A systematic review of patient-reported outcome measures for cancer caregivers identified 16 domains and 5 overarching themes that represented the total criteria of current caregiver outcome measures . The themes included lifestyle disruption, wellbeing, health of the caregiver and managing the situation and relationship. There was, however, no single outcome measure that covered all of these criteria relevant to ICs. Given the negative impact that is experienced by a large proportion of ICs, there is an urgent need to identify their unmet needs and provide appropriate support. MYCaW is a validated patient-centred outcome measure that quickly captures all the concerns of people with cancer in a way that is not possible with a predetermined list of items . Our previous research has comprehensively mapped the concerns and wellbeing of people with cancer internationally, using Measure Yourself Concerns and Wellbeing (MYCaW) [32, 33, 34]. This ensures that service users’ perspectives are represented in the routine data monitoring, evaluation and research . The current MYCaW coding framework only represents cancer patients’ concerns. MYCaW data gathered in a service evaluation of the Living Well course at Penny Brohn UK (PBUK) revealed that the concerns of ICs were as complex and severely rated as those of people with cancer . The aim of this paper is, therefore, to report the development of a new MYCaW coding framework for the analysis and reporting of the concerns of ICs of people with cancer. The research was carried out in several iterative phases and in two cancer support charities, to capture a range of data from people in different parts of England (see Fig. 1). Penny Brohn UK (PBUK) is a leading UK charity specialising in ‘whole person’ support for people with any cancer and their ICs. PBUK contributed to the National Cancer Survivorship Initiative (NCSI) vision  and has implemented a free Living Well with the Impact of Cancer course. This course provides clients with a range of self-management tools, advice, information and support to help manage the impact of cancer, complementary to medical treatment. The information and techniques provide support for the whole person: physically, psycho-emotionally, spiritually, relationships, community, environment and practical issues. Cavendish Cancer Care is an independent UK charity supporting families affected by cancer and helped to develop MYCaW . They offer support through a tailored package of care to address particular needs and concerns of people with any cancer, and their ICs. Specifically, they provide emotional and practical support alongside an extensive range of therapies. This service also runs a dedicated Children and Young People’s Service to provide whole family support, and a Cancer Buddies programme in which volunteers who have experience of cancer help others affected by cancer. Analysis of ICs’ data from an earlier service evaluation  highlighted concerns about providing support, relationships, physical and mental health of the patient and their own (ICs) physical and mental health. To understand the breadth of concerns experienced by ICs, an online survey of 12 open-ended questions was administered via SurveyMonkey. Participants were not restricted in the length of their answers. The questionnaire was administered between 24 January 2014 and 28 February 2014. ICs were eligible for phase 1 if they had attended a residential Living Well with the Impact of Cancer course at PBUK’s National Centre (Bristol, UK) in 2013 and provided their email contact details. Suitable participants were sent an invitation email by RJ at PBUK explaining what the research entailed, a link to the survey and a unique code (given by PBUK) to access the questionnaire. Pseudoanonymised data was received as the survey response, but any concerns that researchers had about the content of responses could be followed up by the medical doctor at PBUK, if deemed necessary using the unique code. A total of 70 ICs were contacted; non-responders were not followed up due to time constraints. Survey data was reviewed and anonymised where necessary. Thematic analysis was carried out by NC and MP, to identify primary themes and categories. A preliminary coding framework and corresponding codebook was then developed (as in Polley et al. 2007 ) for piloting in phase 2. The caregivers coding framework was piloted using retrospective anonymised MYCaW concerns from 76 ICs who attended a Living Well course at PBUK (either residential at the National Centre or non-residential at other UK locations). ICs’ concerns were independently coded by RJ and NC and compared. RJ and NC talked through disagreements so that the codes could be amended and new codes added to the framework. Phase 3 was used to determine if the coding framework would cater for MYCaW concerns from ICs from a different cancer centre and/or in a different geographical location. The revised framework from phase 2 was next tested on data from 144 informal caregivers who had either attended a Living Well course at PBUK between June 2015 and March 2016, or who had received support from Cavendish Cancer Care between April 2015 and March 2016. Two hundred eighty-eight MYCaW concerns were independently coded by four researchers (RJ, MP, CF, MS). Minor disagreements were identified and discussed in depth. Minor changes to the coding framework and codebook were made until all concerns reported by the ICs could be incorporated. We collated data from 2 organisations and we do not have full control to deposit all the data. Data from a total of 241 people was used to develop the IC coding framework (see Fig. 1). Participant characteristics for each phase of the research are described in Table 1. To explore the breadth of concerns that ICs experienced, responses, ranging from 1 to 15 sentences, were analysed. Many responses provided rich and raw accounts of ICs’ experiences. All responses were coded deductively and analysed using a thematic approach . Three responses indicated the respondent was having difficulty coping, so the participants were identified and contacted by the medical doctor at PBUK. Discussions between NC and MP aided in the development of organising the themes into two sections: ‘informal caregivers’ concerns for self’ and ‘concerns about the informal caregiver-person with cancer dyad’. This most clearly differentiated between the impact on the ICs as individuals and the impact on the patient-caregiver dyad. Codes were then organised into themes within each section (see Fig. 2). Five main themes described the range of impacts that the role of being an IC had on a person (top half of Fig. 2)—psychological issues, emotions, physical concerns, identity change and concerns around providing support. Many responses described the IC role as stressful which had a noticeable negative effect on their physical or emotional health. Other responses demonstrated the worries experienced by ICs around not knowing how best to effectively support a person with cancer or cope psychologically with the uncertainty of their situation. Participants explained how the role of IC had a significant impact on their own identity as they stopped socialising, gave up education or reduced their work hours. This was particularly so when caring for a person who was at the ‘end of life’ stage of their cancer. “My husband and I were always very active but now he can’t do much so I just stay in with him so he’s not alone. Also I left my job a few months ago to be with him […] and just feel I have to do everything for my husband to make his last days happy no matter how worn out I am […], now it’s just housework mainly and preparing food”. Five themes were identified relating to the impact of being an IC on the dyad (lower half of Fig. 2). These included relationships, the physical health of the person with cancer, the psycho-emotional health of the person with cancer, practical concerns and concerns relating to end of life of the person with cancer. Participants explained how communication between members in the dyad would affect their relationship, especially if each person was hiding their feelings for fear of causing distress to the other. Sometimes, this extended into concerns about the end stage of life, although the experiences and concerns often started before the patient was at the end of life. Participants also explained how they were concerned for the health of the person they were caring for, either the physical or psycho-emotional health. These themes were developed into a coding framework with an accompanying coding guide, which was then piloted on retrospective MYCaW concerns data in phase 2. MYCaW concerns from 76 informal caregivers at PBUK were used to pilot the new coding framework. Three additional codes were independently identified by both researchers (RJ, NC) and added to the framework. These were ‘spiritual wellbeing’ to address references to faith or purpose and meaning in life; ‘concerns about other family members’ such as the effect of the cancer diagnosis on siblings and children; finally, ‘lifestyle information’ to address concerns on where to find reliable information on stress management, nutrition and exercise. Phase 3 was used to determine the content validity of the caregiver coding framework at two different organisations. MYCaW data were coded independently by RJ, MP, MS and CF. All researchers identified the need for codes on ‘coping’, ‘frustration’, ‘isolation’ and ‘grief’ when coding ICs’ data from Cavendish Cancer Care. Finally, two codes which did not occur as MYCaW concerns, despite being identified in phase 1, were removed. The final coding framework is detailed in Table 2 and comprises of 10 themes (supercategories) and 40 categories. The framework remains split in two sections to reflect the different concerns the IC have about themselves, and the concerns ICs have about the person they are caring for. We set out to explore ICs’ concerns and to use these data to devise a MYCaW coding framework specifically to represent their concerns. This multicentre study demonstrates the wide-ranging concerns of ICs, and the crucial ability of MYCaW to capture this data. Concerns ranged from ICs’ own psychological and emotional wellbeing and concerns about providing support to the person with cancer, to concerns around the physical health of the person with cancer (see Fig. 2). The concerns identified are supported by previous research on the impact of a cancer diagnosis on spouses, friends and family members who are in an IC role as they readjust and adapt to the impact of cancer on their lives [12, 21, 22, 26, 39, 40]. Data collected in phase 1 of this research especially captured the reciprocal impact of concerns on the IC and the person with cancer. Appropriate provision of support for the ICs is, therefore, likely to also have reciprocal and positive effects on their own health and wellbeing and that of the person with cancer [41, 42]. The content of the coding framework was also compared against previously published data [11, 12, 28, 42]. Our coding framework fully captured categories identified in other published research, although a more extensive search needs to be carried out to confirm this. Moreover, we identified that ICs wanted to know how to obtain reliable information on lifestyle such as stress management and nutrition and relaxation techniques for themselves and the person they were caring for. This unmet need was also noted when developing the first MYCaW coding framework for people with cancer  and is a category that is not covered in the context of lifestyle changes in any of the outcome measures recently reviewed by Shilling et al. . Five outcome measures in the systematic review  ask people to rate levels of stress, and a further four refer to levels of distress, but this is a different context to ascertain whether people have reliable information to manage their stress levels. It is important that charities and other organisations providing support to ICs and people with cancer, in the UK and internationally, fully understand the needs of this group. Routine data collection in this way will enable provision of targeted support to ICs who are showing signs of known predictors of increased caregiver burden, and, therefore, increased risk of conditions such as anxiety and depression [43, 44]. The challenge remains as to how to routinely capture and quantify unmet needs in an acceptable and reproducible way, without interfering with the flow of a consultation. MYCaW has been used internationally as an effective person-centred tool for capturing the concerns of cancer patients, across many complementary and integrative care settings [e.g. 45]. This new IC coding framework enables the same MYCaW questionnaire to be administered, but data for ICs are to be analysed to fully represent their needs. As with the existing MYCaW tool, data can quickly be coded into ‘Supercategories’ only, such as ‘psychological and emotional concerns of supporter for themselves’ and ‘relationship between supporter and person with cancer’, to suit organisations without dedicated resource for qualitative data analysis. More in-depth analysis of the supercategories can be carried using the 40 categories, if resource is available. This study has many strengths, including capturing data from a wide range of participants of varying ages, from two organisations and multiple locations in the UK. Both PBUK and Cavendish Cancer Care support people with any cancer type so it is likely that a range of cancer types are represented. A rigorous independent coding process and further refining of codes occurred with each additional dataset to develop a coding framework that truly reflects the concerns and needs of ICs. This form of analyst triangulation allowed for multiple ways to view the data and thorough discussion on the coding process, in addition to strengthening validation of findings. This framework is aimed at an adult population as opposed to an IC of a child, teenager or young person with cancer; hence, further work is needed to determine how representative the coding is for ICs of these groups. A further limitation is that the framework has only been tested on data from the UK and further international collaboration and testing of the framework is invited. We were unable to ascertain the cancer type or grade/stage of people with cancer that were being supported across phases 2–3. This may, therefore, have impacted on the concerns identified by ICs and the content of the IC coding framework. Testing the coding framework on several datasets across two organisations, however, allowed for further refinement, therefore strengthening transferability of the coding framework to be used by different cancer organisations. We have not yet compared patient and IC’s MYCaW concerns or scores within dyads, although this would be a valuable next stage of research to understand the reciprocal nature of the dyad relationship in more detail. Finally, we have not compared MYCaW concern types or scores with any specific PROM used to measure caregiver burden. This research would provide more understanding as to whether MYCaW concern scores could be a quick predictor of caregiver burden in a clinical setting. MYCaW is already an effective person-centred measure of the concerns and wellbeing of people affected by cancer and is used in many complementary and integrative oncology clinics. A qualitative coding framework has now been developed so that the concerns of ICs can be understood in the same holistic way. The external validity of this framework is improved by the inclusion of data from two UK organisations covering many different age groups, locations and cancer types (of the people being supported/cared for). Despite the existence of several tools for measuring quality of life or burden in ICs, MYCaW is the only person-centred tool specifically designed for capturing the concerns of ICs through their own words. The accompanying IC coding framework means that this data can be analysed using a rigorous and reproducible method, allowing the data to be reported in a standardised way. This will allow the voice of ICs to be equally heard and recognised so that the crucial support they need can be designed and delivered in direct response to their needs. Further research on the content validity of the IC framework in other cancer support centres is welcomed. The authors would like to thank all the participants who shared their experiences of being an informal caregiver and Michelle Griffiths for her support in formatting the manuscript. All procedures performed in phase 1 of this study was approved by the University of Westminster’s Faculty Research Ethics Committee and has been performed in accordance with the ethical standards as laid down in the 1964 Declaration of Helsinki and its later amendments or comparable ethical standards. Informed consent was obtained from all individual participants included in phase 1. For phases 2 and 3 of this study, formal consent was not required. CF and MK worked at Cavendish Cancer Care and HS and RJ worked at Penny Brohn Cancer Care whilst this research was being carried out.